Every day we all see, hear or think of things we need to remember. Usually we grab a pad of sticky-notes, scribble a reminder and put it on the desk, the fridge or the relevant page of a magazine. Mentioned on Mashable this week, Facebook has started testing threaded comments on the Web version of the social network. Rather than posting a replay at the end of a long string of comments, this allows Facebook users to directly reply to comments within a conversation that's on a user's Timeline page. In January, we asked a small group of pinners to test a new look designed to make discovering things on Pinterest easier. Since then, we've talked to some of these folks, analyzed their feedback, and made a few changes. Today, we're thrilled to start sharing the new look with everyone. There's an old English saying, "Keep a thing seven years, and you'll always find a use for it." Today is Twitter's 7th birthday, which we observe on the day @jack first tweeted. Since then, we've seen breathtaking velocity in Twitter's growth, which is due entirely to your many uses of it. Smarter search. That's the promise from social networking web site LinkedIn with its revamped search capabilities. In a blog post announcing the new search tools, Johnathan Podemsky, who according to his LinkedIn profile is a product manager at LinkedIn, noted that 5.7 billion "professionally-oriented searches" were done on LinkedIn last year. 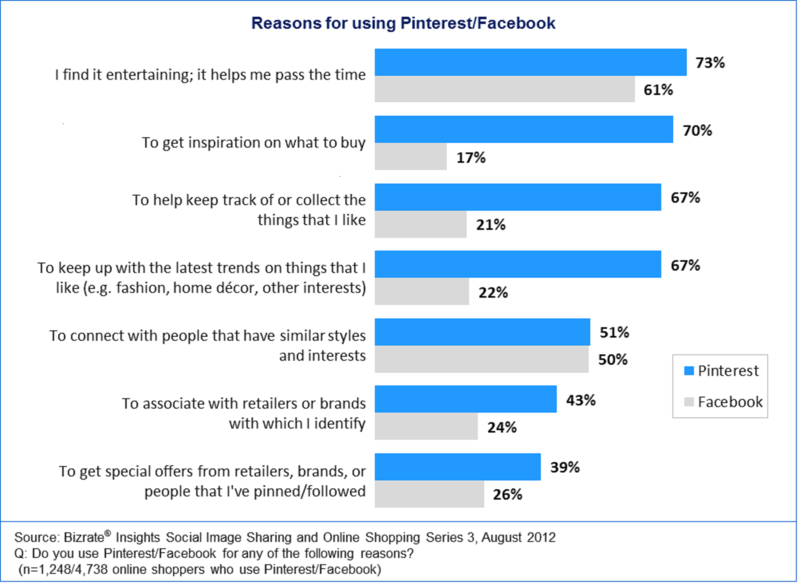 Sixty-nine per cent of online consumers who visit Pinterest found an item they’ve purchased, or want to purchase, compared to just forty per cent of online consumers who visit Facebook and found the same, according to the latest study in the Bizrate Insights Image Sharing and Shopping Series. The Bizrate Insights study, which contains results from more than 7,000 verified online buyers in August 2012, compared Pinterest and Facebook engagement across a variety of shopping activities and usage occasions. It provides insight for retailers and marketers seeking to understand how online consumers are approaching Pinterest and other social media outlets. Pinterest is the stronger vehicle for brand association. Forty-three per cent of Pinterest members agree that they use Pinterest to “associate with retailers or brands with which I identify,” compared to just 24% of Facebook users who agree to the same use with Facebook. Pinterest is a pinboard-style social photo sharing website that allows users to create and manage theme-based image collections such as events, interests, hobbies, and more. Users can browse other members’ pinboards for inspiration, ‘re-pin’ images to their own collections or ‘like’ photos.